Despite often massive investment, many digital transformation efforts fail. Why? One of the biggest culprits is business and IT leaders viewing digital transformation as a pure technology play—e.g. the flawed mindset that you can just plug in a new app, solution or system and let it run. 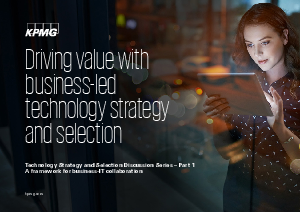 KPMG’s approach to Technology Strategy and Selection (TSS) helps companies take full advantage of emerging technologies by aligning the technology strategy with the future aspirations of the business. Learn how KPMG helps business and IT leaders join together to strategically choose, implement and leverage technology to enjoy their full benefits.